'The Cut' raises furor in Turkey, draws threats from nationalists. Excavations in the area of Yerevan, capital of the Republic of Armenia, have unearthed new evidence of the pre-Christian Kingdom of Van or Urartu. Rettung für das Theater der Bach-, Luther- und Telemannstadt Eisenach! The Eisenach Theater, founded in 1879, represents a cultural asset for the entire Thuringia region, with its vast repertoire of music, theater, and puppet theater. Now, in the context of dwindling resources for cultural budgets, the theatre is threatened with closure. Intellectuals, artists, citizens, and friends of the German cultural tradition have joined forces to protest the threatened closure. The petition they are circulating has already won massive support, and needs more. With the Palestinians being welcomed as members of UNESCO, a new chapter has opened in the strained relations between Israeli authorities and the Palestinians over historical and religious treasures in the occupied territories. While Israeli military operations have damaged or destroyed many sites, in Nablus and Bethlehem, for example, Israel’s official archaeological and tourism policy attempts to lay claim to many others – especially in Jerusalem, which it claims as the eternal and undivided capital of Israel. At the Shakespeare festival in Essen, Germany, youth from theatre schools in Shanghai, Sibiu (Rumania), Ramallah, New York, and Essen joined from October 29 to November 8, to perform Shakespeare’s Midsummernight’s Dream (Sommernachtstraum). The individual groups performed the piece in their own languages separately, then presented a multi-lingual international production together at the Folkwang University of the Arts (Folkwang Universität der Künste). 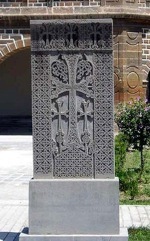 On June 18, the Surp Giragos Church in Diyarbakır hosted a service attended by the local mayor, diaspora Armenians, professors, historians, and clergy. The church, one of the largest in the Middle East, was restored through the efforts of Armenians from Istanbul and the diaspora, as well as the Diyabakır Sur Municipality and the Turkish Culture Ministry. A larger service is scheduled for October. An exhibit at the Paris UNESCO House, from June 15-24, featuring Armenian Khachkars (cross stones), provoked a scandal after UNESCO representatives removed references to place names, including a large map. Since many of the Khachkars presented in photographs at the exhibit are located outside Armenia, in present-day Azarbaijan and Turkey, they bear testimony to the presence of Armenian life and civilization in these geographical areas which were once part of historic Armenia. No explanations were given for the removal of the place names and map. The exhibit is an event organized at a high level, sponsored by the Republic of Armenia’s Ministry of Culture, and attended by diplomats, historians, and art experts. An open letter of protest to UNESCO was sent by the Collectif VAN (Vigilance Armenienne contre le Negationnisme) whose representatives were present at the inauguration of the exhibit. The youth orchestra made up of Israeli, Palestinian, and other Arab musicians received the Dresden Peace Prize. Ragib Zarakolu, a writer and human rights activist, received the “Hakob Maghapart” medal in Yerevan, for his campaign for recognition of the genocide against the Armenians in 1915. Bethlehem to be Named World Heritage Site? The Surp Giragos Armenian Church, restored in a joint effort of diaspora Armenians and the Diyarbakir Metropolitan Municipality, will be open to hold the Divine Liturgy. Who Are the Oldest Wine-Makers? Classical music in the Ottoman empire benefited greatly from the contribution of Armenian musicians and composers, as documented in two new books on the subject. As part of the process of building the infrastructure for a future state, Palestinian musicians have launched the Palestine National Orchestra. “Debut Concert for Palestine National Orchestra in Ramallah,” Classical Music News, January 3, 2011. Thousands of magnificent churches in historic Armenia testify to its rich architectural tradition. Recently an exhibit opened in Istanbul documenting the contribution of Armenian architects to that city. The West-Eastern Divan Orchestra received the Westphalia Peace Prize in Münster, Germany.